Finally ... a word from Leonard Slatkin on the circumstances that caused him to be fired from walk away from the MET's La Traviata. Yes, I know. Everyone keeps saying, "Oh, that Slatkin! He wasn't prepared. He conducted terribly. He didn't know the score." Blah... blah... frickin' blah! Even New York Times critic writer Anthony Tommasini, who loves every minute of a good brouhaha, got in on the action saying he had "seldom heard such faulty coordination between a conductor and cast at the Met." While the Maestro in the pit is the one driving the bus, all it takes is one obstreperous, exigent and spitefully venomous diva to throw the entire thing into a tailspin. Enter Angela Gheorghiu, the Romanian Uber-diva and soprano. In an interview with the Detroit Free Press, Maestro Slatkin, 65, who withdrew from La Traviata after one performance, broke his silence and addressed the issue for the first time. He disassembled the opening night debacle, defended his preparation and detailed the conflict with the accomplished but erratic Ms. Gheorghiu. Slatkin did not completely absolve himself from blame and admitted he made mistakes opening night. But what he called Gheorghiu's "unprofessional behavior" -- blocking his view of other singers, taking outrageous liberties that went beyond liberal notions of expressive phrasing, entering early and ignoring cut-offs -- so unnerved him that he lost his cool in the second act. 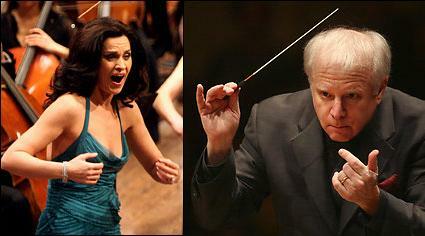 And that's not all, Ladies and Gents ... hop on over to the Free Press article where Maestro Slatkin takes aim at diva behavior and, as shocking as it may seem, admits that backstage politics are what led to his departure from the MET.